Next up in our list of goodness and one I think most of you will be looking forward to playing, is Elden Pixels retro inspired PC platformer ' Alwa's Awakening ', which is going to be released this month Jan 2017. In this game you play as Zoe, a heroine sent from another world to bring peace to the land of Alwa. 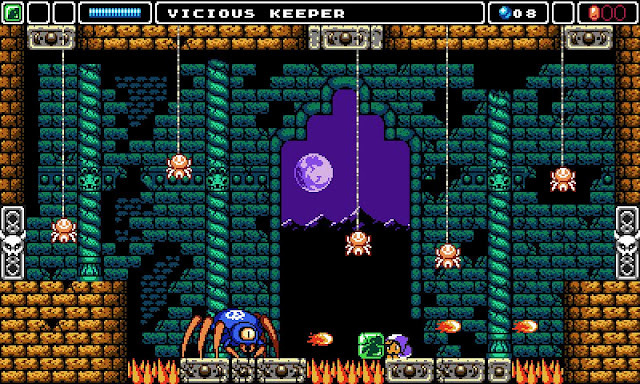 You must use your magical staff against all manor of strange beasties and big bosses through many different rooms, while also solving puzzles to uncover the secrets in this challenging and charming 8-bit inspired adventure game. Furthermore according to Elden Pixels, there will be no hand holding in Alwa's Awakening, instead you are free to traverse the game however you see fit using your magical staff. It will have over 400 unique challenging rooms, a soundtrack filled with catchy chiptunes by Robert Kreese, and an almost authentic 8-bit graphical look which will hopefully take you back to the glory days of the NES. Coming Jan 2017 to Steam!